I picked up this recipe from Chef Carrie Nahabedian, from a class I took years ago. I was attempting to “organize” my office recently to no avail and came across a thick stack of papers, recipes from classes I’d taken pre-culinary school. Most held little interest now but this one stuck out … as I recall, they were quite good. 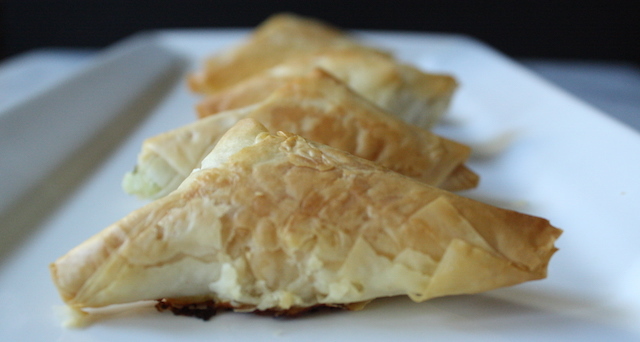 Crispy thin layers of phyllo filled with creamy, slightly salty cheese. No spinach, no vegetables just that gorgeously salty cheese with a little parsley for a bit of color. 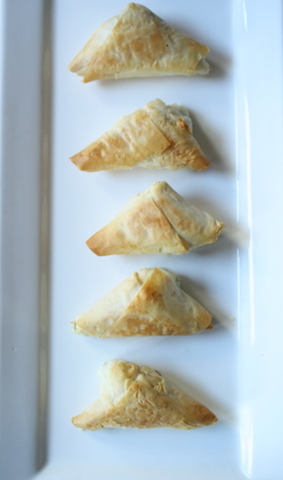 She called them Phyllo Cheese Triangles but being of Armenian descent, I suspect she calls them boeregs at home. Many Mediterranean cultures have something similar; the Greeks call them tiropitakia. 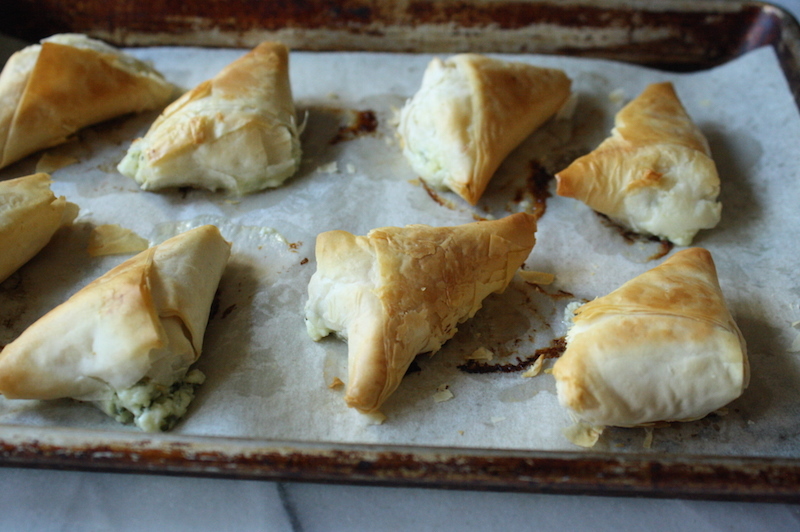 Salty cheese wrapped in layers of crispy pastry have universal appeal. Once the decision was made, I started thinking about the ingredients. While I could certainly pick up everything at my local grocery store, I wanted something a little more authentic. So I drove to a fabulous international grocery store not far from my house that is really fun to wander around. They carry the greatest stuff and I seemed to recall they had a large selection of fresh feta cheese, a key ingredient in this recipe. I was not disappointed. Though there was a ridiculously large refrigerated case displaying countless of tubs and packages of feta, I walked right by with my eye on the prize. Just beyond this case was a deli counter with 18 types of fresh feta cheese, giant chunks of beautiful white cheese sitting in tubs of brine. 18 different kinds! Greek, French, Bulgarian, Romanian … it was all represented. Overwhelmed, I asked the counterperson for a recommendation and she said her current favorite was the French variety … creamy, not too salty and full flavored. She offered a taste and I thought it was quite nice, so I bought it. If you have the option to buy fresh, please do. It is worlds apart from the pre-packaged and pre-crumbled cheeses, which tend to be overly salty, dry and subpar. 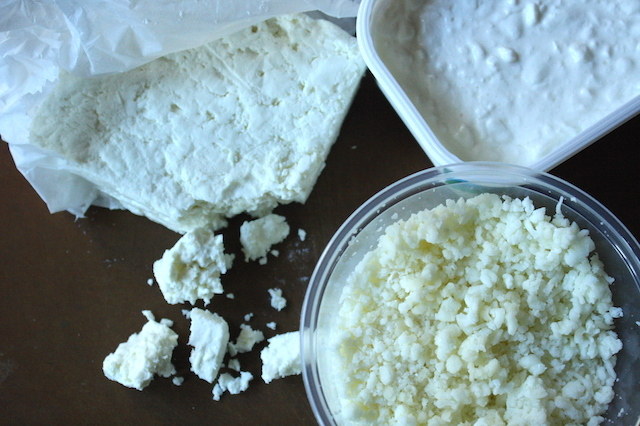 I had a tub of grocery store feta crumbles in my fridge and once home, compared the two. Not even close. Next up was phyllo dough. I usually buy it in the freezer section of my regular grocery store and have exactly one option. I let it defrost overnight in the refrigerator and sometimes it’s perfect and other times it’s complete crap – sheets stuck together, multiple tears, a mess. But this time, since I was in this fabulous grocery store that had 18 kinds of fresh feta, I figured they had some pretty good phyllo too. Oh how right I was! I couldn’t find it without assistance because it was refrigerated, not frozen, essentially ready to go. And there were choices! At least 8 different brands, including one that appeared to be handmade from a local bakery, and I had the choice of several different classifications. What the hell was a phyllo classification? When you have no choice, this isn’t really something you consider. So I stood in front of the phyllo wall, googling the difference between #4, #7 and #10 country style. Turns out (thank you google) that #4 are the thinnest sheets, best for pastries and anywhere you’d like a flaky pastry though it can prove a little challenging. #7 is a tad thicker and a bit easier to use if you’re prone to phyllo freak-outs. It’s best for larger style pies and desserts but will work well for pastries too. #10 Country Style is the thickest, still a flaky sheet of thin pastry but the easiest to use and best for savory pies, strudels and desserts that will be soaked in syrup, such as baklava. I had no idea these classifications existed. So of course, I bought a box of #4. Thin was where I wanted to be. If you don’t have options, don’t fret. The regular box at the grocery store will work just fine here. Every time I bring up phyllo, someone has a horror story. I understand; it can be incredibly frustrating to work with if you don’t take the proper precautions and more so if your store didn’t handle it properly in the first place. First off, and the best piece of advice I can give you is this … don’t dawdle. Work quickly and efficiently. Don’t stop in the middle. Have your filling ready. Have your butter melted. Have your sheet pans on standby. Don’t walk away. Use up all the dough, then make that phone call. Almost as important: once the phyllo is unwrapped, keep it covered. These are thin sheets that dry out, turn crumbly and impossible in an instant. Some people cover the sheets with a barely damp towel but I’ve found that even if I carefully keep a layer of plastic wrap between the damp towel and the dough, somehow an edge always gets wet and fuses together in the most annoying way. So I skip the towel, use a generous layer or two of plastic wrap to protect the sheets from air exposure and follow the cardinal rule of moving quickly. Here’s my final tip: do not skimp on the butter. I cannot emphasize this enough. The pastries should be light and flaky and to achieve this, each layer needs to be brushed fairly judiciously with melted butter. Don’t get all diet-y here or you’ll have thick, dry, unpleasant pastries. Just use the damn butter. You’ll be happier for it. Butter makes it better. So here’s how this will go down: first up you take one sheet of phyllo and lay it nice and neat lengthwise in front of you then brush evenly with melted butter. Top with another sheet – I find the easiest way to do this is to hold one sheet at the top two corners, match the bottom corners to the buttered sheet on the counter as best as you can, and carefully lay the top sheet down away from you. If a sheet is torn, don’t fret. Just overlap the pieces slightly on the buttered base stack to create a sort of patch and carry on. Brush this second sheet with butter and repeat until you have a stack of 4 sheets. Do not butter the 4th sheet. Next cut the phyllo into long strips. How you do this depends upon how large you want the triangles and/or how many you’d like to make. Smaller strips = more pieces. I prefer smaller triangles, appetizer sized portions, so I cut the dough stack lengthwise into 6 strips. If you’d like bigger triangles, cut 4 strips. It’s all about personal preference at this point. Put a spoonful of the filling at the bottom of each strip and fold it up to seal. Visualize the folding of an American flag – corner to corner to corner and tuck – that’s what we’re going for here. Do other countries fold their flags this way? I honestly have no idea. At this point, I’ll freeze until solid though you can certainly bake immediately. The key is not to let them sit … either bake now or freezer for later. 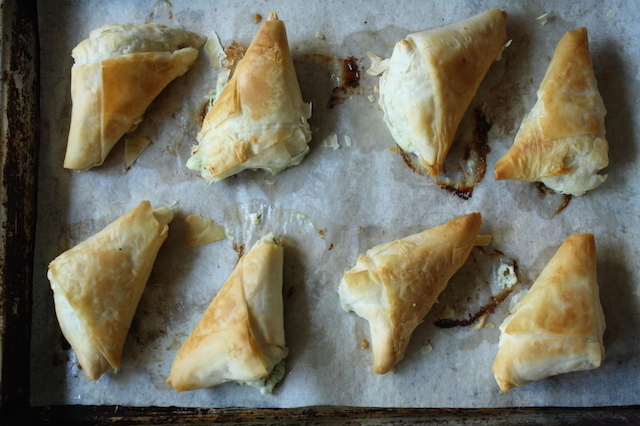 The phyllo will get soggy and become an unpleasant disaster if left to its own devices. When ready, bake until nice and crispy and serve warm or room temperature. They make the perfect party appetizer, a great lunch served with a salad and, if you have some tucked in your freezer, a delightful quick snack in about 20 minutes. STRESS THERAPY BAKING FACTOR: MASTER OF THE SHEETS. Yes, I know. Those impossibly thin sheets of phyllo dough can be unbelievably aggravating. Conquering this one can be incredibly satisfying. Just remember: be prepared, work quickly and don’t fear the butter. You’ll be fine. Relax. Exhale. Make a plan, get your stuff together, put some good music on and bang it out. They’re not that hard once you get the hang of it. Pass around a tray of these beauties at your next get together and your friends will be amazed. This is also one of those unique items that are completely unaffected by freezer storage. Bake fresh or from the freezer; there is really little difference. So who needs to know? I add a little garlic to the original recipe, because I like the flavor it adds. Look for kefalotiri or mizritha in better cheese sections or better yet, seek out a grocery that stocks Mediterranean ingredients. If you can’t find it, I suppose you could use parmesan. Chances are good you’ll have a little extra filling – it is wonderful on a grilled piece of bread, broiled until slightly bubbly. If your phyllo dough is frozen, defrost overnight in the refrigerator. This cannot be hurried. Line a sheet pan with parchment paper and if baking today, preheat oven to 375ºF with a rack in the lower third of the oven. For the filling: In a medium bowl, crumble the feta into small pieces. Add the cottage cheese, eggs, parsley and garlic; mix thoroughly to combine and season with pepper. Add the grated kefalotiri/mizritha to taste – careful, it’s salty. Melt the butter and have standing nearby with a pastry brush. Assembly: Remove the phyllo from the wrapper and carefully unfold onto a large cutting board or directly on the counter. Cover with a sheet or two of overlapping plastic wrap so the phyllo is completely covered on all sides – it dries out very quickly and can become a bit difficult to work with so don’t dawdle. Brush the surface evenly with melted butter. Do not drown the sheet in butter; use just enough to give a nice even coat. Top with another piece of phyllo and brush evenly with melted butter. Do this until you have a stack of 4 buttered sheets – do not butter the top sheet. Cut the dough lengthwise into 6 long strips. Place 1 teaspoon of filling at the base of the strip. Fold the strip into a triangle shape, back and forth, to the top of the strip, pinching and tucking the corners in as you go to seal in the filling. You want nice tidy, tight little packages. Brush the triangle lightly with butter and place on the parchment lined sheet pan, seam side down. Continue until all the dough and/or filling is used. You may find yourself short a few sheets of phyllo. 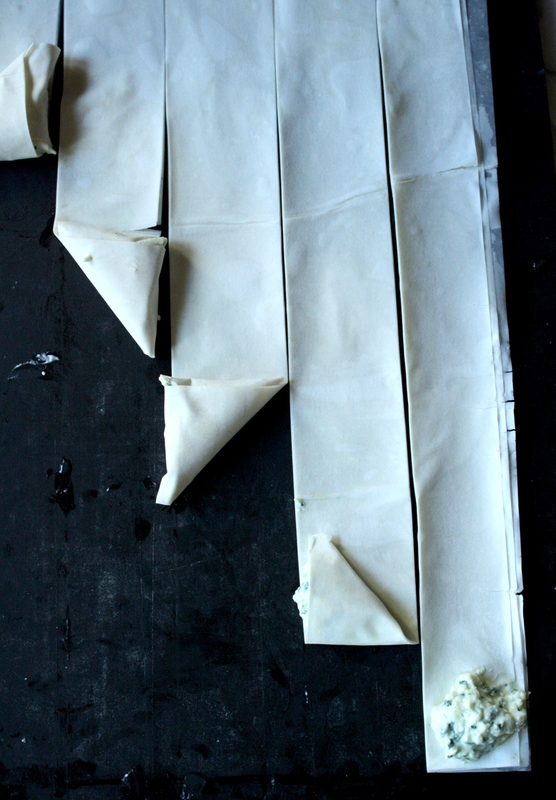 If this happens, either use less sheets this last round or cut the phyllo sheets to make enough layers/strips. Or toss them and call it a day. If there is any remaining melted butter, brush the finished triangles to give an extra coating. To bake: place the pan in the lower third of a 375ºF oven and bake until crispy and golden brown, about 15-18 minutes total (about 22 minutes if baking frozen). Halfway through baking, flip the pastries so they’ll brown evenly and give the pan a spin. To freeze: arrange the pastries in a single layer, wrap the entire sheet pan in plastic wrap and freeze overnight. Once solid, transfer to a large Ziploc bag with the name, baking temperature and baking time and store in the freezer up to 2 months. Bake as directed, adding a few minutes to the baking time. Serve hot or room temperature. These will hold and stay perfectly crispy for about an hour, maybe more. If you want to make ahead, I’d recommend freezing and baking just before you’d like to serve them.